What was supposed to happen? 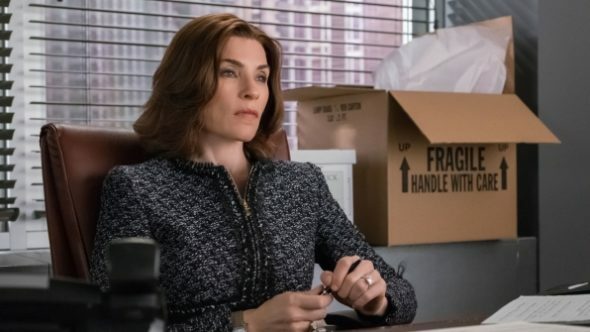 The Good Wife creators Robert and Michelle King recently explained the final scene of the CBS series and revealed an alternate ending, TVLine reports. The legal drama ended last night after seven seasons. It starred Julianna Margulies, Chris Noth, Christine Baranski, and Matt Czuchry. She was becoming more and more like her husband, and, ultimately, Diane was the collateral damage. That we found interesting. Over seven years could you completely remake your character? Could a victim become a victimizer? What do you think? Did you watch The Good Wife series finale? Did it end the way you wanted it to? Actually I am glad that it’s over. The show was declining after Will’s death. All the interesting characters disappeared (Kalinda, Will, later Finn, Bishop, Zach) and it became boring. I am afraid 22 episodes were too much for a season in general. Although I enjoyed the first 6 seasons, I could not find much joy in season 7. I found the end terribly disappointing. It ended perfectly, despite the naysayers’ complaints. It couldn’t have ended any other way–not realistically. This is not a romance novel. The finale ruined the whole series for me. Couldn’t have ended any worse than it did. I was very disappointed there will be no Season 8, and killing off Will was way too sad for Alicia. The story and characters were great; why stop. Alicia character was played the greatest. I was very really disappointed with the last episode of The Good Wife. I felt like Alicia deserved better, she was entitled to be happy. CBS you screwed the pooch on that ending. After all Alicia and all of us that invested a night each week watching I feel like we were ALL robbed of a happy ending for Alicia. It’s my opinion CBS let us ALL down. Way to go CBS.. I don’t understand. Surely there are so few GOOD programmes around, why would you want to finish one that has been such a great success. It has hardly started and it’s been taken off. Doesn’t make sense. CBS have made this same mistake with so many good dramas. The story lines are great. The characters are great. WWHHhhhhyyyyyyyy………………. I was really disappointed with the last episode of The Good Wife. It was such a wonderful show and to have an ending that was beyond what I expected it to be.